of the larynx in 1995. 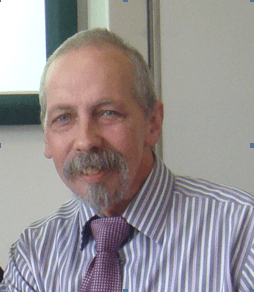 A former teacher working with challenging pupils in Glasgow and Nottinghamshire, Derek became involved in numerous aspects of patient involvement at local, network and national levels. As the founder Chair of the Consumer Liaison Group, Derek assisted with the development of patient participation in the establishment and work of the National Cancer Research Network /Institute and was a board member. Derek is Chair of the Confederation of Cancer Biobanks and a Steering Group member for the Experimental Cancer Medicines Centres (ECMCs). From 2001 until 2006 Derek was Chair of Gedling Primary Care Trust in Nottinghamshire, England gaining 3 stars on inspection. From 2005–09 he was Chair of Nottingham City Crime and Drugs Partnership where crime was reduced by more than 34% and more than 3000 people received drug treatment. This contribution to health services in particular cancer led to being awarded an OBE in the Queen’s Birthday Honours list 2006. Currently Derek is the Associate Director for Patient & Public Involvement at the National Institute for Health Research for the Clinical Research Network (NIHR CRN). The Network provides the infrastructure for the delivery of Diabetes, Mental Health, Dementias, Stroke, Cancer, Medicines for Children as well as a Primary Care and Comprehensive studies in research. Derek lives in Nottinghamshire works as a freelance consultant with his own company providing training and development mainly in the charity and public sector. Most recently, Derek has become the Chair of the Throat Cancer Foundation charity that was launched in February 2013. Joe is a retired se nior police officer who has held, amongst other roles, the post of Deputy Head of Learning & Development with Essex Police where he managed the Initial Police L&D Program, the CID L&D Program and the Practical Skills Wing including Weapons, Public Order & Driver Training. Earlier on in his career he attained a National Police Training Certificate and became a full-time trainer at a District Police Training Centre where he delivered practical skills and law based training to newly recruited police constables for a full three-year seconded term. During that period, he further qualified as a Training Development Officer and completed the D32 and D33 assessing NVQs. More recently he has undertaken the FA Develop the Developers Course, the FA Level 1 Tutor Course and the Award in Education & Training. As well his extensive experience training police officers he has designed and delivered training to local authorities for Street Wardens and Community Patrol Officers and designs and delivers training to referees at several different levels on behalf of the FA. He took the Events and Public First Aid course with EDMS in 2015 and practices as a First Aider. As well as designing & delivering First Aid courses he designs and delivers a wide range of other Human Factors training designed for managers and team leaders. He is fully CRC checked and has completed Safeguarding Training.